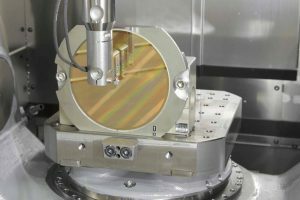 SCHAUMBURG, IL (May 2017) – HEIDENHAIN’s family of KGM grid encoders have once again been improved to better meet the needs of CNC-controlled machine users who require accuracy testing. Now the KGM 281 is available with a measuring range of Ø 140 mm and an increased accuracy of ± 1 μm. As part of HEIDENHAIN’s KGM grid encoder series, the 281 model’s grid plate with phase grating has an optical measuring standard. It is embedded in a two-piece aluminum holder. The design of this holder prevents mechanical stress from being induced at the level of the measuring standard even if the mounting surface is not plane. This makes it possible now to guarantee the accuracy grade of ±1 μm for the system. The KGM 281 can be mated to the same dimensions as the previous KGM 181, but due to the revised mechanical design it is 21.5 mm higher. All HEIDENHAIN’s KGM grid encoders dynamically test the contouring accuracy of CNC-controlled machine tools. They can perform, for example, circular interpolation tests with radii ranging from 115 mm down to 0.1 mm at feed rates up to 80 m/min. The KGM can also perform free-form tests in two axes. The advantages of the KGM include its contact-free measurement, which eliminates the influence of ball bearings such as with the DBB. Also, the error resulting from the machine’s geometry has no influence on the results of circular interpolation tests with very small radii. For more information, contact HEIDENHAIN’s Product Specialist for Machine Tools Julian Renz at 847-884-4761.